First: Start moving your right foot around in a clockwise motion. Now try to draw a 6 in the air with your right hand. It forces your foot to stop and/or go in the other direction. You just can't keep it going. Crazy. Second: This is the "d'oh" moment of the day. 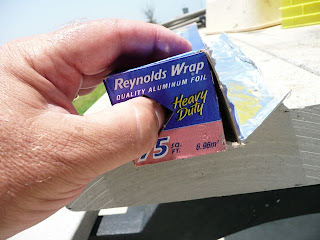 Reynold's Wrap/Saran Wrap rolls can lock in to their boxes! (Don't pretend you already knew about this and that I'm the only crazy one.) There's a little tab at the end of the boxes that says "press tab to lock in" or some variation thereof. You push it in, and it locks the roll down so it doesn't go jumping all over the place when you try to tear a piece off. I just went to go look at the rolls in our kitchen and, sure enough, the boxes have those tabs and they were not pushed in. Situation rectified, by one slightly silly-feeling blogger.